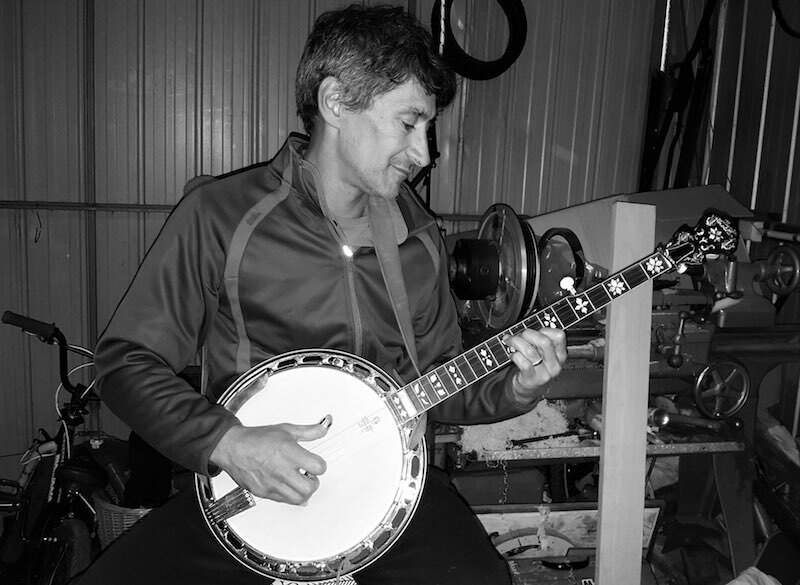 Some eight years ago Leon Reihana started building banjos at his home in Carrun Downs Victoria. He now provides a valuable service to banjo enthusiasts across the country. Leon discovered the banjo when he lived in Frankston around 2002-2003. His friend – a guitar player – returned home from a festival with a banjo. Leon was captivated by the sound of the banjo and more importantly transfixed on the number of components that, from first observation, made up the banjo. Leon is a motor mechanic who commenced his trade in the field of drag racing. The art of finely tuning a drag racing engine requires the careful assembly and tuning of many critical parts. Leon saw a similar need for the assembly of the banjo. Here was an instrument that required careful assembly of a collection of vital parts to make a fine sounding instrument. He was smitten. Leon bought his first, affordable, banjo. Thinking it was a top-notch instrument he went to see Jim Golding (Coolgrass fame). Jim quickly set him straight on what a good banjo needs – good tone and action. Leon found a copy of Earl Scruggs book and followed the instructions on how to make a block rim. This rim greatly improved the sound of his newly acquired banjo. Harking back to his drag racing experiences he discovered that you could change the engine in a banjo and get a better sound. Leon was on the road to discovery. There was a good number of banjo enthusiasts in Australia, some of whom were already making banjos. He set off to meet with them and increase his knowledge on the composition of a great banjo. Leon tracked down and met with other instrument makers such as Rodger Buckmaster, Pat Doole, Ray Black, Alan Funk, Wayne Beckett, David Aumann, Greg Deering and many more over time. He then spent months and years talking with American builders and banjo pickers via email and web chats. He got to talk with international companies who make Huber banjos, Hatfield banjos and smaller known luthiers and pickers like Sonny Osbourne, Kenny Ingram, Glenn Millar to name just a few. Like a sponge, Leon soaked up all of his learnings and through continued study, practice, testing and experiments, enjoyed many failures and breakthroughs. Being on this new journey was one of his life’s most exciting experiences. During his time of research and testing, he partnered with a friend of his called Peter Elias and together they created Banjo Brothers Australia. They spent time trying to sell the idea that a cheap banjo could be improved for a few hundred dollars by changing the rim and doing a professional set up. They invested time in visiting local festivals to show that a cheap banjo can sound quite good for a budget shopper who does not want to spend what to some would amount to big money. Peter and Leon got a fair bit of interest and made sales and made some people very happy. Each of the partners felt that the next step was to try to match the sound and quality of established makers such as Gibson and Stelling in the USA and the locally popular Grundy banjos from Australia. They believed in their skills and new-found knowledge. 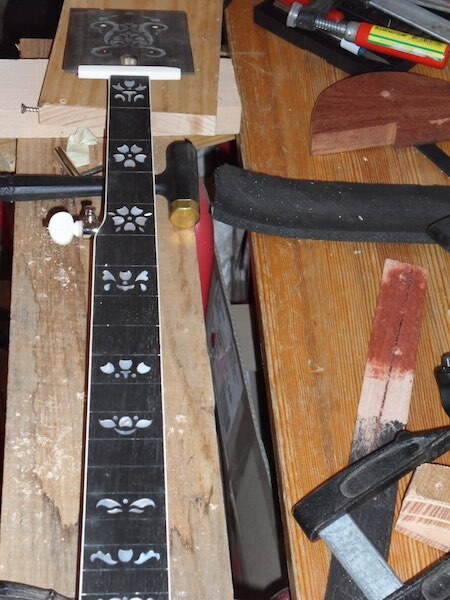 Thus was born the Banjobrothers Eureka, a direct Gibson banjo clone. They chose the vintage Huber tone ring and other components as well as V2 Waverly tuners with flame maple for the neck and the engine room. We have never been prouder of our 2 demos which we both still own and treasure. We love putting them in people’s hands to experience the quality, the sound and the feel – Leon Reihana. The company enjoyed many sales but sadly few were prepared to invest the $4,500 for their treasured Eureka model banjo. Some of the banjos now reside in New South Wales and Queensland. Today Leon is on a path to kick-start a community based Australian business. wanting to promote his fellow bluegrass friends, be it advertising, sharing, finding help, finding a teacher or jamming partner etc. 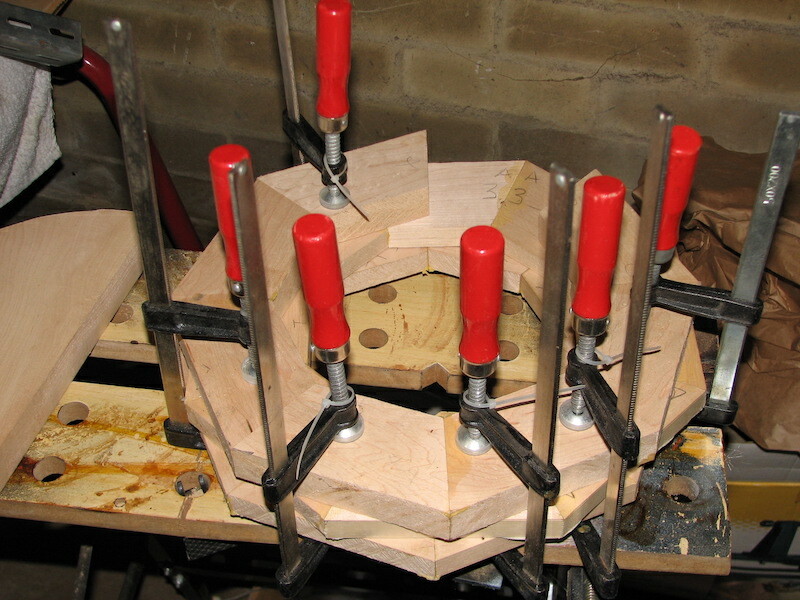 Leon is mostly making banjo rims and bridges these days while replacing real skins on banjos, ukuleles, mandolins etc. He still undertakes banjo set ups. I try to get my customers to stay and watch me work and ask questions. 99% stay and enjoy the experience of seeing their banjo stripped to 50 pieces then reassembled correctly with a major result in sound quality. Your banjo will never leave the shop sounding worse than it came in. They also see that I respect their instrument and there is no smoke and mirrors or cheating their pockets – Leon Reihana. Leon’s newest adventure is a light weight resonator banjo that will suit people with injuries, women and children. The banjo will still pack a punch and ring like a bell. So far Leon claims that the results are exciting with a weight of 7.8 pounds not 12 plus pounds. Sales of these rims have commenced. I would like to thank everybody I have helped over the years for trusting me with their prized instruments. If you are not pleased call me, I am happy to say not one of you has ever come back with complains in the past 10 years. I just want to spread the knowledge and help people carry out their dreams and wild ideas customizing the banjo – Leon Reihana. Leon now operates under the name Folk Instruments Australia and can be contacted through the website. We wish Leon all the very best for the future and thank you for sharing your experiences with us all at AustralianBluegrass.com. Leon’s journey reflects the man that he is, True and Real. I am proud to be his friend and part of his story. Enjoyed reading this story Greg, Good one! It’s always very interesting to hear how someone falls into getting involved in this music. Thanks Lachlan – wish we could find more of them.